Is Greek Yogurt the New Mayonnaise Treatment? 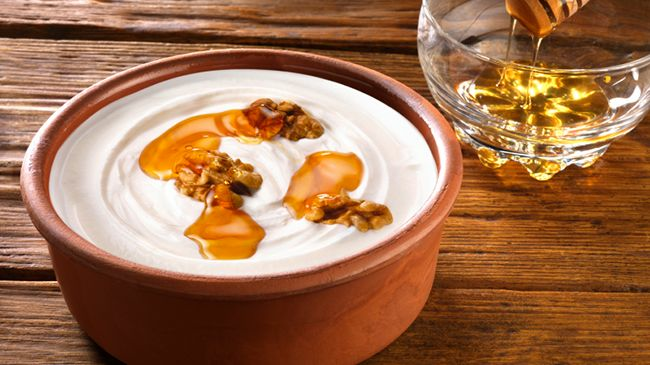 Yogurt is one of the oldest and most popular fermented foods around the world. Yogurt (plain, nonfat) is low in calories and packed with calcium and good live bacterial cultures. In recent years though, people have been going gaga over Greek yogurt and for good reason. Greek yogurt is higher in protein and has roughly half the carbs and sodium of regular yogurt. It is created by lengthily straining regular yogurt to remove the whey and lactose, leaving behind a thicker textured yogurt. Is Greek yogurt great for hair? Greek yogurt (or any yogurt for that matter) is great for protein treatments that will help build up your hair’s damaged cuticle from chemical or heat applications. It will increase shine, add moisture, and make your hair softer. It is much better for your hair than mayonnaise, which actually does not work as a protein treatment because the proteins are too large to fit into the hair cuticle. Greek yogurt is the better choice for a DIY protein treatment because it can penetrate the hair shaft. Greek yogurt is the better choice for a DIY protein treatment because it can penetrate the hair shaft. I enlisted the help of scientific consultant Yolanda Anderson, M.Ed., RPhT to explain the effects of greek yogurt on hair. According to scientific consultant Yolanda Anderson, “Hydrolyzed yogurt protein is the hydrolysate of yogurt protein derived by acid, enzyme, or other method of hydrolysis. Derived from essential yogurt proteins in a hydrolyzed form. Does Greek yogurt from the store work? There are some proteins in Greek yogurt we buy in the store that are small enough to penetrate the hair shaft. It brings down the pH level and strengthens the hair by way of it smaller proteins, amino acids, lactic acids, and unique lipids from the milk. Greek yogurt from the store is perfect to help rebuild the damaged cuticle and strengthen the hair. All in all, this makes Greek yogurt a viable DIY ingredient for a protein treatment despite not being completely hydrolyzed protein that one would find in a commercial beauty product because some of the proteins along with the amino acids and lactic acids still nourish the hair and penetrate the hair shaft. Yogurt is even better when used with honey, and natural oils (like coconut or olive) to create a powerfully moisturizing protein treatment or mask. Now you can toss your mayonnaise treatment in exchange for the new DIY protein provider that gets the job done.